This easy Vegetarian Shepherd’s Pie recipe makes a great dish for vegetarians and a lighter meatless alternative for carnivores. The dish bursts with goodness in the form of beans, vegetables, and herbs and a delicious sweet potato topping, which also makes os lower in carbs. What is not to like. The dish is a complete meal in itself needing little else for serving but if you feel something is needed, crusty bread or a crisp green salad is a great accompaniment. If you have leftover Vegetarian Shepherd's Pie, it freezes well. Boil the sweet potatoes until soft, drain. Place the milk and butter in the pan used to boil the potatoes, return to the heat and warm gently until the butter has melted. Add the sweet potatoes and mash. Season to taste and keep to one side. Heat the oil in a large deep pan. Add the onion and carrot and fry for 5 minutes. Add the garlic and cook for another minute. Add the beans, mushrooms and one quarter of the vegetable stock to the onion and carrot mixture and cook for 5 minutes. Add the remaining stock, tomatoes, parsley, coriander and season with a little salt and pepper. 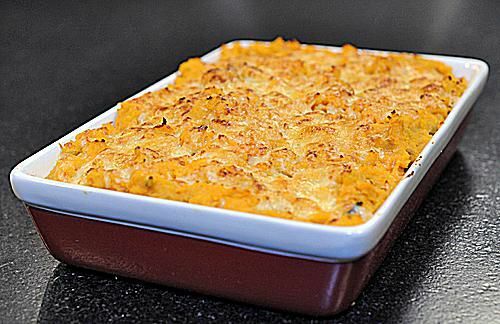 Place the sauce into an 8"/ 20cm by 3"/7cm deep ceramic or glass ovenproof dish and cover with the sweet mashed potato. Sprinkle the grated cheese on top of the potato and bake in the heated oven for 30 - 35 mins until the surface is crisp. browned and bubbly. Serve immediately. Use any mixture of canned or cooked beans. If you don't have cooked beans you will need to begin the dish the day before by soaking the beans, then cooking. Or you can simply use up cooked beans but so much easier for this dish is to buy a can of already cooked beans. Choose your favourite mixture of beans: I like white beans, flageolet, red kidney and to add texture, some chick peas. Ring the changes with different herbs. Delicious.